How to become a Firefighter. Have you ever thought about becoming a Firefighter in the UK? Read our free guide about becoming a Firefighter. Job Description: Fire Officers are persons who are responsible for extinguishing fires and helping in other emergency situations. Fire Officers are generally expected to be reasonable, fair, Level -headed and willing to work unsociable hours and capable of remaining calm in stressful situations. The hours vary, but tend to be 8-12 hour shifts. Being a Fire Officer is a good job for many people, but the key traits to have are a sociable personality, helpful, intuitive, a good sense of humour and calm under pressure. You must be capable of working at height, and in hot and frightening areas. To become a Fire Officer you must be a British Citizen, EC/EEA National, Commonwealth citizen or a foreign national with no restrictions on your stay in the UK. You will be subject to a CRB check to ensure that you have no serious convictions. You don’t require formal qualifications as the Fire Brigade set their own entry tests, including a written test. 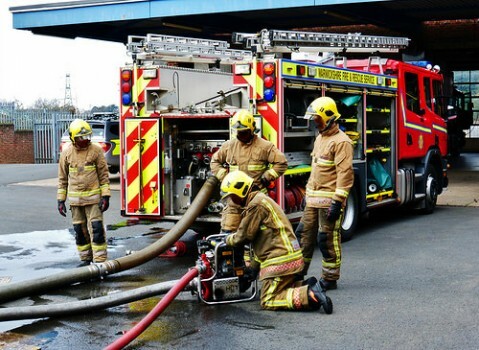 As there is a huge demand for Fire Officer roles, any experience you can show of community service such as local volunteering or community based experience will go in your favour. Standard duties vary dependent on the day to day calls. Fire Officers are responsible for answering emergency calls when the alarm is raised and attending the scene. They are responsible for ensuring that all persons are removed from the hazardous situation and providing them with first aid if required, and then dealing with the situation, such as containing a spill, or extinguishing a fire. They are also responsible for securing scenes after a hazard. In the community they have standard non emergency tasks to carry out such as checking water supplies are usable in the event of an emergency, carrying out house calls in order to fit smoke alarms and advise on fire safety, and carrying out demonstrations at schools and fairs to show how to get out of a fire safely, and how to handle chip pan fires etc. These may vary depending on the duties and job you are doing. Many Fire Officer Jobs can be 9-5, whilst just as many can be out of hours. Usual shift length is 12 hours. Many officers are expected to work weekends and evenings. Shifts are always rota based so that there is an even coverage of officers. Fire Officers can expect to progress through their careers with improving skills and knowledge as well as time served. You may find yourself buddied up with trainee officers that are employed alongside you. If you experience other departments within the brigade you may find yourself being trained into promoted roles. You may choose to study additional subjects such as explosive material handling awareness to assist in gaining such a promotion. The average salary for a Trainee Fire Officer is £21,000 PA. The average salary for a qualified Fire Officer is £30,000 PA.